A severe toothache can make life really miserable, and usually means you are fighting a deep tooth infection. A deep tooth infection is a serious matter, and can cause a number of oral and overall health issues. In the past, the only solution for a tooth suffering from a deep tooth infection was extraction. Thankfully – with the help of modern dental technology – there is another option. 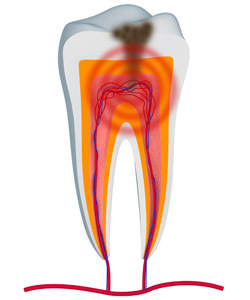 Root canal therapy allows us to treat teeth that have deep tooth infections and preserve your natural teeth. Our highly skilled team will gently and carefully remove infected pulp and decay from the problem tooth. Next, we will clean out the tooth, making sure that no harmful bacteria remains. Once this is completed, we will insert a special antibiotic medicine and permanently seal the tooth. Most teeth will need some extra protection after having a root canal. We can professionally place a beautiful porcelain dental crown to help protect your tooth, and give it extra strength and durability so that you can keep eating the foods you love. Severe Chronic Toothaches | A severe chronic toothache that just does not go away usually means that your tooth is battling a deep tooth infection. A root canal can help alleviate the discomfort caused by a toothache and help you get back on the path to great oral health. Swelling | If you are experiencing swelling around your tooth, you might be fighting an infection. If the swelling does not go away, you may require a root canal. Abscesses | If you have noticed an abscess that has formed on your gums by a tooth, there is a good chance you may need a root canal. An abscess usually means that an infection has gone deep into your tooth. A root canal can help remove your abscess and restore your oral health. At Inspire Dental, we care about your oral health. We are proud to provide root canal treatment in the comfort of our friendly Mesa office. Have any questions about root canals or the symptoms of a deep tooth infection? Please give us a call today!